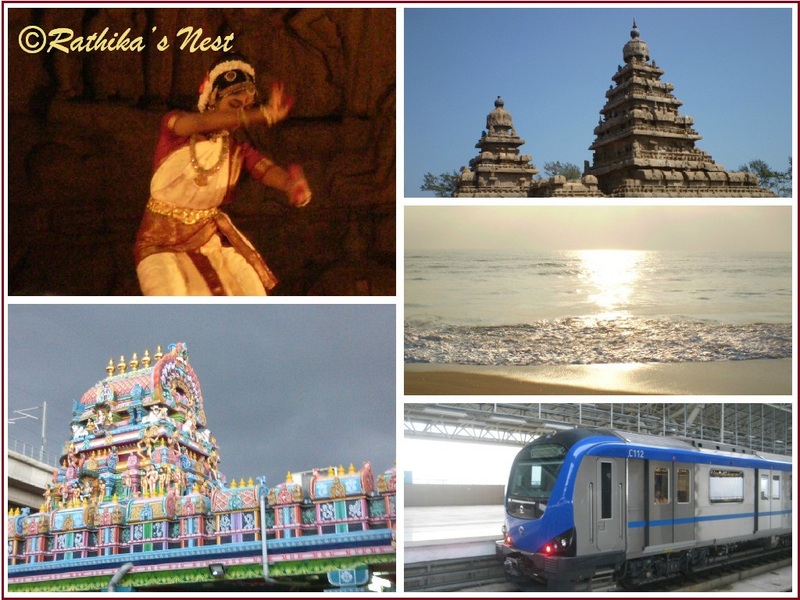 Rathika's Nest: Chennai Now and Madras Then ! Chennai Now and Madras Then ! Today Chennai has completed 375 years since its creation and this day is celebrated as Madras day every year. Madras as I knew it had gradually changed to Chennai we see today. I moved to Madras in 1987 and made it my home since then. Having grown up on the foothills of Western Ghats, my first impression of the city was lack of green cover and fresh air. It took a few years for me to get used to the typical ‘Hot, Hotter, Hottest’ climate of Madras! Madras was less crowded with slow paced life and flourishing cultural activities. Beach has always been an attraction and we used to visit Marina beach frequently with my son, who enjoyed playing in the sand. Marina was not as dirty or crowded as it is today. Beauty of the sea water reflecting the moon light and the silver sands of the beach used to make a captivating sight on full moon day. Commuting was comfortable even by public transport. I used to enjoy riding my bike on Madras roads! Today, travelling has become a nightmare whether one rides a motorbike or drives a car. Rains were seasonal and water logging was not a problem in the 80’s. Nor was the city littered with garbage everywhere, which is a common sight today. Walking on the roads was a pleasure once, and it was common for people to go for a stroll. With more and more people using cars and bikes, Chennai has become a city with most polluted air. City has grown exponentially in the last two decades, without infrastructure development to match the growth in several places. Ever increasing population growth (48.28 lakhs in 2015) has added to the city’s woes leading to overcrowding, water logging, garbage accumulation and frequent traffic jams. As a result, Chennai has become the third most polluted city in India. Infrequent rains and depleting greenery have led to water shortage. However, there are positive developments such as laying flyovers to reduce traffic congestion, metro rail service to facilitate commuting, continuing rain water harvesting and developing green cover, to name a few. Both public and private health infrastructure have grown phenomenally, and one can get the most advanced therapies in the city hospitals today. Chennai continues to be the cultural capital of India, playing host for various art forms like music, dance and drama. December music festival and Mahabalipuram dance festival are very popular. In addition, Chennai is also home to many premier educational institutions. Like any other metro, Chennai has its share of problems with urban development, transport, garbage disposal and water supply. Nonetheless, I have made Chennai my home, and today I like my city as much I like my native place. I miss some of the features Madras had, but I do hope Chennai will eventually overcome its problems and become a model Metro. Happy Birthday Chennai!